Your Finished Book is Your Passport | Writing & Book Coach | Marla Beck, M.F.A. I’ve had the good fortune to coach some pretty accomplished men and women to finish their books and create a sustainable, happy writing habit. Many of these men and women have turned personal illnesses, setbacks or other challenges into the source of their inner strength and passionate commitment to serve others with their writing. Many of these writers have focused their passions on creating stellar careers, powering themselves to work as highly respected, successful leaders in business, law, venture capital, corporate management, academia and journalism. In most cases, these accomplished midlife people will tell you they’ve got a darn good life. They’re financially resourced. Spiritually grounded. Reasonably fit. Connected to family and friends. They’re even encouraged to write by supportive spouses, partners or friends. Yet squarely in the heart of their busy, happy lives, these accomplished, midlife folks are living with a painful secret. Despite their impressive resilience and happy, comfortable lives, something huge is MISSING: that book or writing project they started — for pleasure or professional gain, is still unfinished. They may tell themselves it’s “just a manuscript” that lies neglected In the drawer or tucked away on the hard drive. Not a big deal. Of course I’ll get to it someday! It’s never just a manuscript. 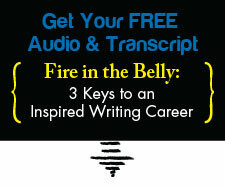 Your finished book is your passport to growing your writing career. Your finished book is a catalyst to help you feel amazing, courageous and WHOLE again. Your finished book is your calling card to create the writing community and connections you crave. I know you love many things in your life. For your sake, your family’s sake and the sake of your readers though… don’t postpone LOVE when it comes to your writing. Let’s get that book done, so you can feel great again and decisively, confidently move on to the next great thing in your writing future. Previous post: Born to Write? Next post: Discouraged with Your Lack of Writing Progress?